C & A Scales specializes in installing above & below ground, concrete, or steel deck truck scales. We offer many different sizes of truck scales to fit the needs of your operation. 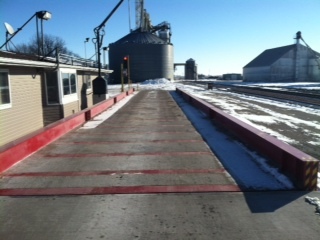 We have been installing Rice Lake and Cardinal Truck scales for over 25 years. With that in mind, we do not leave unless the customer is satisfied. After the concrete foundation work is complete, our techs come in and do a number of different things such as; set the scale, install the load cells, wire the scale, calibrate, and place it in service for where the scale is located. We provide a 30 day check up on the scale to make sure everything is working properly. On our truck scale installs, we can provide the customer with an outdoor readout display along with truck scale software. By doing this C & A can make your harvest season and everyday weighing easier. For more indepth technology on your truck scale we have options of doing outdoor printers, tag readers for identifying the driver, and an outdoor message board for the customer to communicate with the driver. There our other possibilites that the customer may inquire about as well. Some of those are; we can install cameras, communication boxes, and lasers to make sure the truck is completely on. Here at C & A, we take pride in our installs and more importantly in our service work. We have 24 hour support which includes 24 hour on call services to make sure you are never down for a long period of time. Our service work provides you with accurate weighing and to make sure your truck scale is in tip top shape for years to come. Copyright © 2019 | C&A Scales, Inc.